The H215M multirole helicopter is an ideal platform for transportation, SAR and C4ISR missions. Image courtesy of Airbus Helicopters / Anthony Pecchi. The H215M helicopter can accommodate up to 24 troops. Image courtesy of Airbus Helicopters / Anthony Pecchi. The H215M helicopter is powered by two Turbomeca MAKILA 1A1 turbo-shaft engines. Image courtesy of Airbus Helicopters / Anthony Pecchi. The H215M is a military version of the H215 civil helicopter. Image courtesy of Airbus Group. 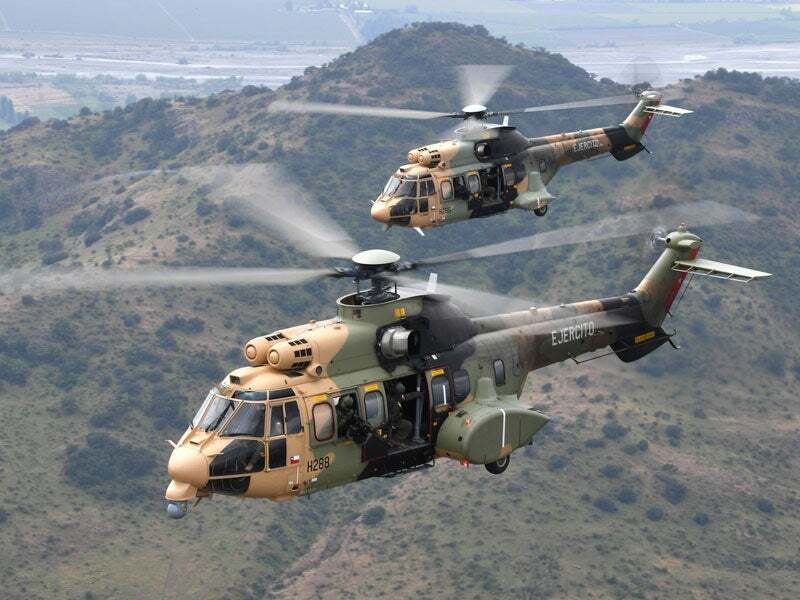 The H215M multi-role helicopter is a military variant of the H215 civil helicopter produced by Airbus Helicopters. It is a member of the Super Puma family of rotorcraft operated by the armed forces of more than 43 countries. The helicopter can be deployed in tactical transportation, logistics, search-and-rescue (SAR), and computerised command, control, communication, intelligence, surveillance and reconnaissance (C4ISR) missions. Airbus Helicopters signed a general co-operation agreement with IAR Brasov in April to appoint it as a prime contractor to supply H215M multi-role helicopters in order to meet the future requirements of the Romanian Ministry of Defence. The H215M can carry up to 24 troops for transport missions. It can accommodate six patients on stretchers and ten passengers for medical evacuation (MEDEVAC) operations. The H215M features a crashworthy fuselage, incorporating a four-bladed main rotor and a monocoque tail boom integrating an anti-torque rotor with five composite blades. The bottom of the fuselage houses six crash-resistant fuel tanks, of which two tanks offer protection against 12.7mm projectiles. The multi-purpose air intakes of the helicopter deliver protection against sand and icing. The fuselage is fitted with high-energy absorption and retractable tri-cycle landing gear, including two trailing-arm main landing units, as well as a castering nose wheel unit. It also includes built-in jacking and towing points, along with attachment points for external loads and fixed parts for sling loads. The cabin features two sliding double doors and eight jettisonable windows. The reinforced floor of the cabin is installed with crashworthy fixed points for mounting a range of seating. The cabin is also equipped with a heating and ventilation system and floor hatch for cargo sling pole. It offers a stowage area for airborne kits, including six static vent blanks, two pilot head covers, an engine air-intake grid protection cover, two engine tail-pipe blanks, two rough weather mooring fittings, an access ladder, a data case, three jacking ball-joints, and a tail rotor blade lock. The full glass cockpit of H215M is equipped with modern avionics, including four multi-functional liquid crystal displays (LCD), two display and auto-pilot control panels, an integrated standby instrument system (ISIS), a redundant vehicle monitoring system, two stop watches, two triple tachometers, a warning panel, a fuel circuit control and monitoring panel, and a control box. It accommodates a pilot and a co-pilot on crashworthy seats. The flight deck is compatible with night vision goggles and installed with a dual-duplex digital four-axis autopilot and associated automatic flight control system. The autopilot is connected with two flight data computers. The vehicle and engine multi-function display (VEMD) aboard the cockpit reduces pilot workload for better flight safety. The helicopter is also equipped with an airspeed indicator, a digital inter-communication system, a radio management system, distance measuring equipment, emergency locator transmitter (ELT), and a radio altimeter. The H215M helicopter can be armed with pod-mounted 20mm cannons, 68mm rocket launchers and side-mounted, rapid-fire machine guns to support attack missions. The power-plant of H215M integrates two Turbomeca MAKILA 1A1 turbo-shaft engines developing a maximum emergency power of 1,400kW. The engines are coupled to main and intermediate gearboxes. The helicopter can fly at a cruise speed of 258km/h and attain a range of 776km when fitted with standard fuel tanks. The range can be increased up to 1,165km with the addition of external and central auxiliary tanks. The maximum take-off weight (MTOW) and sling load capacity of the rotorcraft are 9,350kg and 4,000kg respectively.